"It's gonna get better," she said to him. "I promise you." 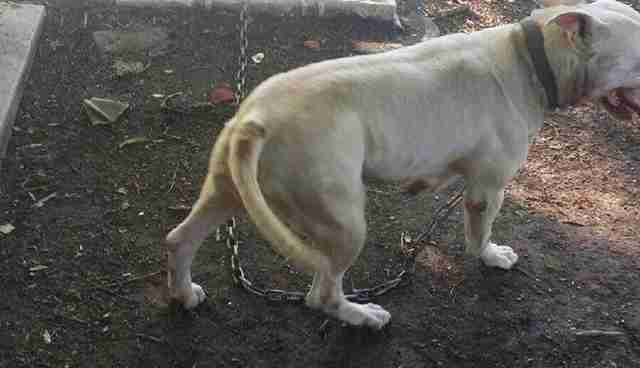 A few years ago, Cane's owner chained him to a tree on property in North Carolina belonging to a relative. 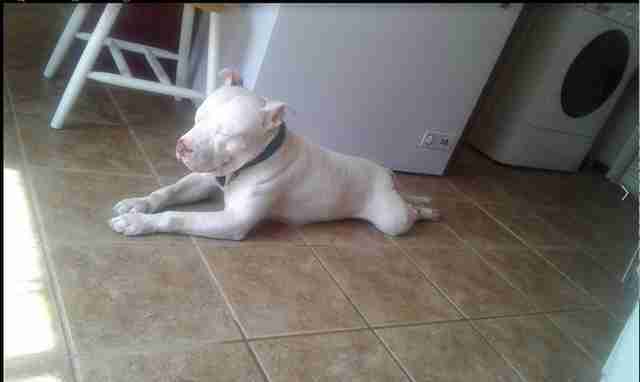 There the pit bull stayed, ever since. Cane got food and water, and had a dog house - provided by animal lover Jamie Spencer, who did her best for Cane and deeply cared for this dog, but couldn't take him into her own home. His situation was, obviously, never good. Then it got dire. In July, the person who owned the property where Cane was tethered died. The new owners said Cane had to go, said "you'd better do something about him," Spencer tells The Dodo. Without knowing how she'd do it, Spencer vowed to Cane that she would make sure he'd be OK.
Spencer reached out to Kari Newton with the nonprofit Animal Adoption League, who'd previously helped Spencer take care of a kitten. Newton rallied the animal rescue troops, searching for folks to help pay for Cane's veterinary care, for a foster home, for people who'd get Cane from the yard where he was tethered to the foster home. None of this would be easy. Cane had bad anxiety from being outside alone for so long; he had serious medical problems for the same reason. But he was a good dog, deserving of a good life. "Cane has never lived a normal pet life," Newton tells The Dodo. "The most heartbreaking issue at hand was that Cane was in a lot of pain and loved humans." Right at the end of September, the various pieces fell into place. 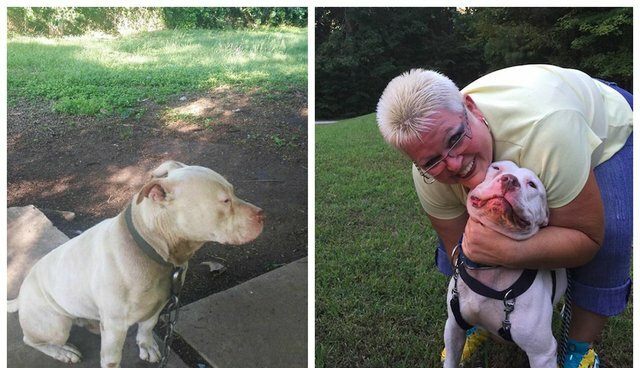 A foster home was found, in Virginia. Volunteers stepped up to get Cane there (and gave him a bath along the way). Newton posted the news to Facebook: "A collaborative effort between two rescues: Dogs Deserve Better and Operation Save a Shelter Dog out of Virginia Beach have come together to rescue Cane and bring him to Virginia for rehabilitation and vetting. We are beyond excited for him. Everyone is working on getting him transported this weekend." Cane got a new name. "I personally believe when you name a dog, it becomes a part of their personality," says Newton. He got called Charlie, at first, said to mean "free man." 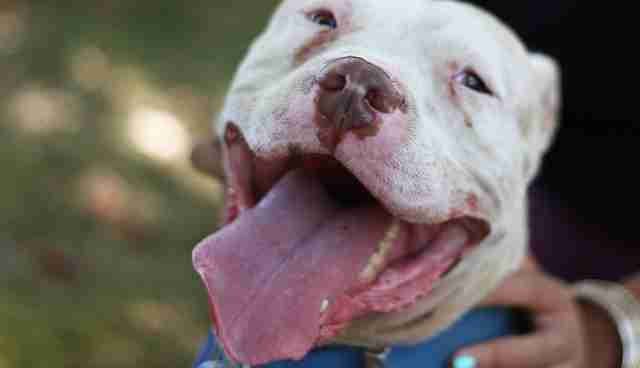 But that then got changed again, to Chance, "because he is getting his second chance at life," Kristina Cuce, one of the many people involved with the dog's rescue, tells The Dodo. Chance has a period ahead of getting fixed up. His fur and skin are a mess, from living outside so long. 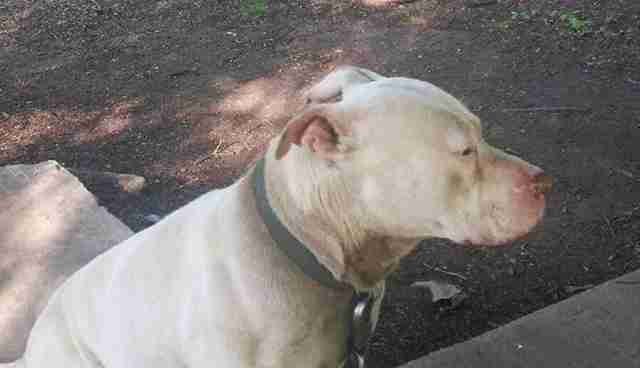 He is heartworm positive, and will need to be neutered, and assuredly has other veterinary procedures ahead as well. This link is to an online fundraiser to help pay these expenses. This is on top of learning how to be around people and other animals; how to be a pet. At some point, when he's well enough, Chance will go up for adoption. Now, he's in a foster home in Virginia, where so far "he is adjusting great," says foster mom Alissa Campbell. "The tail just keeps wagging, and it looks as though he is smiling," she says. "He just wants love, they all do." Seeing Cane become Chance has put Spencer's mind at ease, too. "It makes me cry," she says. "He's living the high life. I don't have to worry about him anymore."